Pete Jones has a piece in The Guardian about an attack last June on a village named Epulu in the Okapi Wildlife Reserve. The perpetrators were Mai Mai Morgan; they reportedly killed three people and ate the heart of one of them. 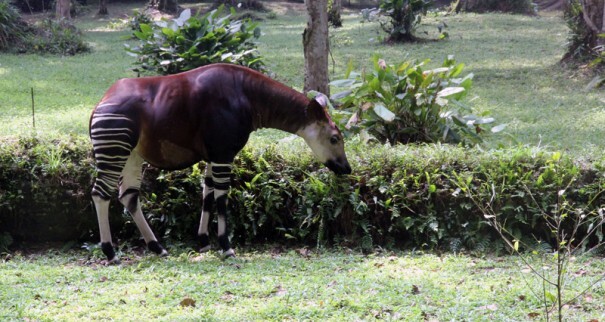 They also killed all 14 of reserve's captive Okapi. The reason for their ire? Epulu is a base camp for the wildlife rangers assigned to stop the ongoing slaughter of the forest's remaining elephants. Some 60 percent of Central Africa's elephants have been killed in the past decade alone, according to the Wildlife Conservation Society, to fuel a growing demand for ivory in east Asian countries. The slaughter of the Okapi was a devastating blow to the reserve's conservationists. Rosemarie Ruf, one of the zoo's co-founders, says it was a brutal end to a lifetime's work. "Twenty-five years of work is gone," she said. "All that effort, all that money. It's my life which has been.... I don't want to say ruined, but here now I'm standing in front of nothing." "The forest is where we find what we need to survive" said one pygmy leader. "[The park authorities] have cut our land, there is now a part we cannot access. It has worsened in the last few years, since the RFO got bigger. We feel like the big non-governmental organizations and the rangers have privileged the animals over the people." With the smoking, drumming, and dancing in full swing, my mind drifted to an article by the geographer Jared Diamond that I’d read – along with Fukuyama’s book – in preparation for our trip. In the piece, titled “The Worst Mistake in the History of the Human Race,” Diamond argues that the transition from hunting and gathering to agriculture – long considered a fundamental driver of human progress – was actually a colossal blunder.